So everyone needs some sort of snacks on Halloween night as we’re often at a friends or friends are at ours. 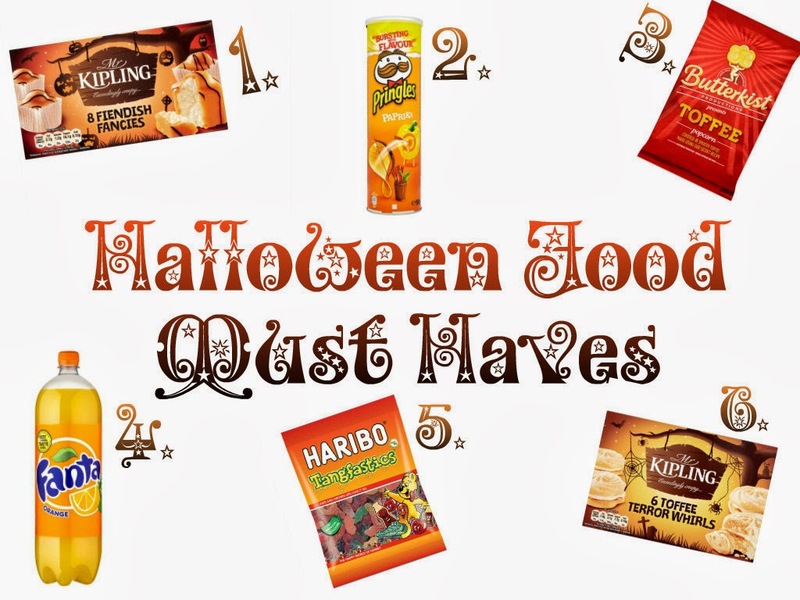 I thought I’d write a blog post on the type of snacks that I like to have on Halloween just in case you need some last minute ideas. I’ve only recently discovered Fiendish Fancies and they’re actually amazing. They defiantly a great treat to have on Halloween as they are only available at Halloween. They’re small cakes with vanilla cream inside underneath orange icing they’re actually delicious and so cheap!! Everybody has to have some sort of Pringles on Halloween they’re essential to any sleepover, party or just when you’re on your own. Pringles are one of my favourite crisps because they’re light but filling at the same time. They also have a huge range of different flavours which is great because they have a different flavour for different occasions. So everyone needs popcorn when they’re watching a scary movie on Halloween right?? Well this is my favourtie popcorn because it’s so delicious but really fattening so I wouldn’t recommend eating it everyday. However if you’re going to get popcorn then get this one Butterkist make the best popcorn around!! We all need some sort of drink so why not go for Fanta Orange as it’s Halloween and the drink’s orange it ties in with the whole night. I love Fanta Orange because it’s a great source of energy when you’re feeling lazy.It’s a great drink to have on Halloween especially if you’re throwing a party for little kids. Haribo always have some sort of Halloween special bags however I always like to eat Tangfastics on Hallowen because they’re sour and tasty. I think that Tangfastics are my favourite Haribo’s I love taking them to school and eating them during class because they’re great for when you’re hungry but don’t want to eat a full meal. Although they’re not very healthy which is why I don’t eat them all the time only sometimes. I love these Mr Kipling special Halloween treats because I love shortbread and buttercream. So the both of them put together makes me love these Toffee Terror Whirls even more!! These treats are great for Halloween as they have no artificial colours which means that they’re made out of 100% natural ingredients. If you love buttercream like me then these should defiantly be on your shopping list for Halloween. "Halloween 2013 | Last Min Make-Up"